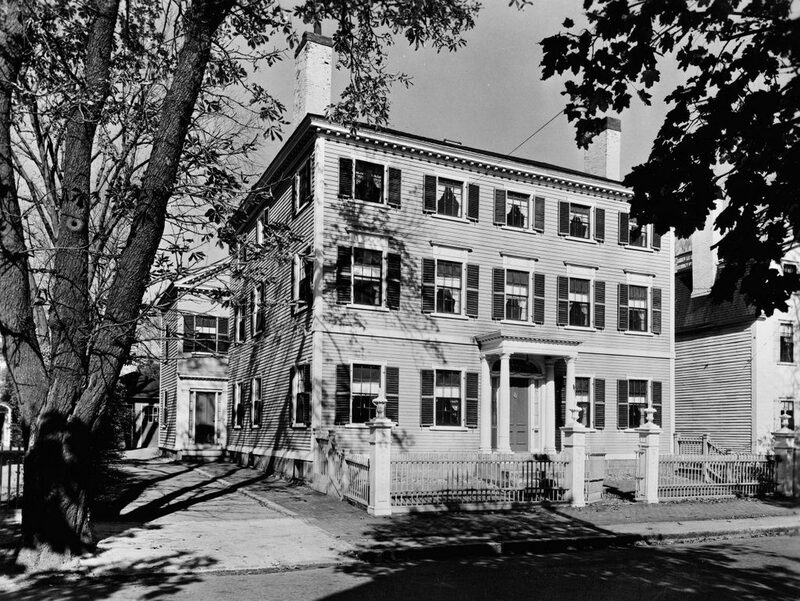 The house at 142 Federal Street in Salem, on November 1, 1938. Image courtesy of the Library of Congress, Historic American Buildings Survey. This elegant Federal-style house was built in 1803-1804, and was among the many works of the prolific local architect Samuel McIntire. It was built during the golden age of Salem’s shipping industry, with a square, three-story a design that was typical for the homes of wealthy mariners and merchants of this period. The original owner of the house was Samuel Cook (1769-1861), a ship captain who built the house a few years after his 1800 marriage to Sarah “Sally” Chever (1779-1863). Cook enjoyed success in the East India trade, but he was also involved in at least one notable shipwreck during this period, when his ship, the Volusia, was wrecked on Cape Cod along with two other vessels on February 21, 1802. The Cooks went on to live in this house for the rest of their lives, until Samuel’s death in 1861 and Sally’s death two years later. The house was then inherited by their daughter, who was also named Sally (1801-1866), and her husband, Henry K. Oliver (1800-1885). Oliver was a notable local politician who held a number of offices throughout much of the 19th century. He began his career as a teacher here in Salem, where he worked from 1819 to 1844, before becoming Adjutant General of Massachusetts from 1844 to 1848. He then moved to Lawrence, where he worked in the cotton manufacturing industry before serving a term as mayor of Lawrence in 1859. 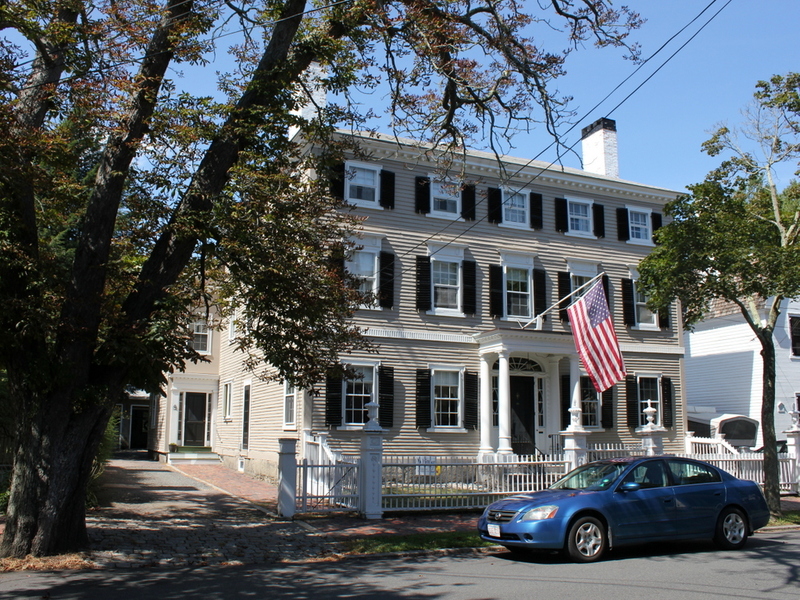 By the time he and Sally returned to Salem and moved into this house, he was serving as Treasurer and Receiver-General of Massachusetts, a position that he held from 1861 to 1866. Then, starting in 1867, he spent two years investigating child labor conditions in Massachusetts, before publishing a report that documented widespread violations of child labor laws in the state’s factories. Following this report, he was appointed as the first chief of the state Bureau of Statistics of Labor, and served in that capacity from 1869 to 1873. He would remain involved in politics until well into his 70s, and served four one-year terms as mayor of Salem from 1877 to 1880. Henry and Sally Oliver had seven children, although all of them were adults by the time they inherited this house. Sally died only a few years later, in 1866, but Henry continued to live here until his death almost 20 years later, in 1885. The 1870 census shows him here with three of his daughters: Maria, Mary, and Ellen. The only other family member living here at the time was his 12-year-old granddaughter, Sarah, who was the daughter of his oldest child, Samuel Oliver (1826-1888). Maria died two years later, but by the 1880 census the other three women were still living here with Henry, who was in the midst of his last term as mayor at the time. Following Henry Oliver’s death in 1885, the house went through several different owners and residents during the next few decades. By the early 20th century it was owned by Caroline C. Johnson, but was being rented by Isaac Caliga (1857-1944), a noted artist whose wife, Phoebe Johnston Woodman, was Caroline’s niece. However, the couple divorced in 1913, and Isaac moved to Provincetown, where he lived for the rest of his life. This house was then sold to Charles Carroll, a dentist who was living here by 1914. During the 1920 census he was living here with his wife Dora and their three sons, and he would remain here until his death in 1934. Dora continued to live in the house, though, and was still here when the first photo was taken a few years later in 1938. Today, the house has hardly changed since the first photo was taken over 80 years ago. The exterior has remained well-preserved, the fence is still standing, and even the tree on the far left side is still there, with little apparent growth even after so many years. It is one of many fine McIntire-designed homes that still stand in Salem, and it is a contributing property in the Chestnut Street Historic District, which was added to the National Register of Historic Places in 1973.